The camp of the Governor of Anambra State, Mr. Peter Obi is said to be jittery over the possibility of the Supreme Court deciding against him in a suit brought by the Peoples Democratic Party (PDP) governorship candidate in the 2007 elections, Dr. Andy Uba, contending that Obi's suit on which the court relied to “extend” his tenure was, ab initio, lacking in merit. The Supreme Court is expected to give judgment on Uba's suit Thursday. Investigations by Pointblanknews.com indicated that Obi, who has been reportedly weighed down by Uba's suit and the threat to his re-election from political forces led Dr. Chris Ngige, whom Obi dislodged in March, 2006, has been reaching out to “strange political bedfellows” to douse the tension. According to sources close to Awka Government House, Obi has lately been fond of the company of a spent political godfather, Sir Emeka Offor, and the chairman of the House of Representatives on Works, Hon. Chuma Nzeribe. Interestingly, while Obi is of All Progressives Grand Alliance (APGA), Offor and Nzeribe belong to PDP, a party the governor publicly denounces. Some of the aides, who volunteered information, insist that their stint with Obi, rather than prove to be a blessing, has proven to be a curse. “Our lives have dipped since we joined this very queer man. We heard Ngige was difficult, Peter (Obi) is impossible,” said one of the key aides, adding, “we just pray the Supreme Court settles this matter so we can go home to our families, as we don't understand any longer the reason we are here. 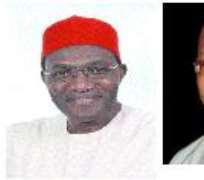 Another source close to the Awka Government House disclosed that the curious romance between the trio of Obi, Offor and Nzeribe may not be unconnected to their common hatred for Andy. “And it was Andy who helped restore Sir E (Emeka Offor) financially. It was (former Vice President) Atiku Abubakar who took him to Andy. I swear, Offor knelt down before Andy, promising never to hurt any of his interests. But, that is man for you,” a former minister told Pointblanknews.com. Pointblanknews.com gathered that the troika of Obi, Offor and Nzeribe may not be unconnected with the recent botched attempt to unseat Speaker of Anambra House of Assembly, Hon. Anayo Nnebe. The Speaker is said to be loyal to Uba. The few lawmakers in the House reportedly loyal to Obi in the House had been reportedly mobilized by Obi to try to dislodge Andy's influence in the House. Obi is reportedly unhappy on the outcome of two recent re-run elections in the state, in which Andy's protégés won by a landslide. “Nothing has devastated Obi more than the victories of Senator IK Obiora and Honourable CID Maduabum. Note that, apart from trouncing Obi's protégés, Emeka Offor, a barely-literate money bag, who considers himself the godfather of Nnewi politics had teamed up with Obi to rout Andy's men, and the outcome had been devastating for them. “With bloodied heads, Chuma, who had also attempted to stop IK Obiora, teamed up with Obi and Offor to ambush Andy at the Supreme Court. They have begun blackmailing the young man. They have begun smearing the Supreme Court judges. They have begun predicting that Andy would win, just to blackmail him and the judges. This is so sad,” sighed one of the lawmakers. Meanwhile, on the political turf, Obi continues to be buffeted from all sides. Apart from the immediate threat by Andy's suit and the Ngige “harassment,” Obi's greater worry appears to be not farfetched-the son of his deputy, Dame Virgy Etiaba, Emeka. Since Emeka made public his intention to challenge Obi for the governorship seat, and on the APGA platform, the governor's headaches have reportedly heightened. Sources close to the governor told Pointblanknews.com that Obi greatly suspects that fifth columnists may be bent on destabilizing his government, and is reportedly not taking the matter lightly. Only last week, the state government officially accused Emeka of supporting the opposition against the Obi administration, a charge Emeka vehemently denied.